One of the hottest patterns around is one of the oldest. Buffalo check and plaid have been around for hundreds of years, and make us think of warm & toasty feelings by a roaring fire. Which makes them perfect for Christmas and the holidays! Usually in shades of red, black and white, these plaids add a generous burst of traditional holiday color with a graphic element. And all that, means you can use it in a modern home as well as a traditional one. These 11 classy buffalo check & plaid Christmas projects add cozy seasonal warmth and a “welcome home” feel. Try these DIY holiday charger plates from ‘Lydi Out Loud’. 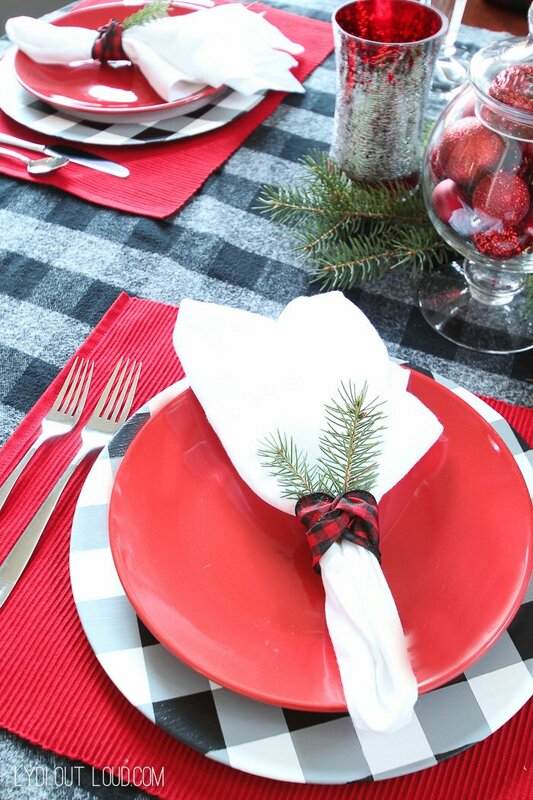 Paired with these Christmas red placemats, they are the epitome of the season. Easy plaid Christmas project that could be used all year round. 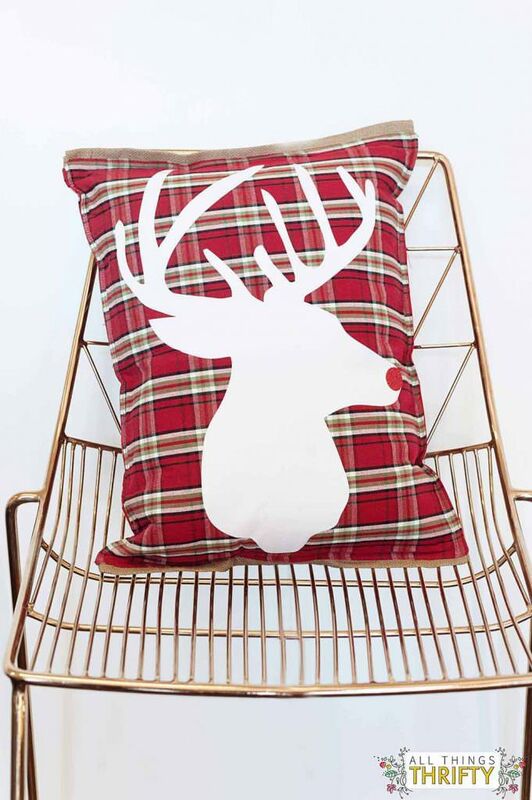 Brooke from ‘All Things Thrifty’ made these adorable DIY plaid Christmas pillows with placemats and iron on images! Reindeer not your thing? No problem, you can pick any image you like. 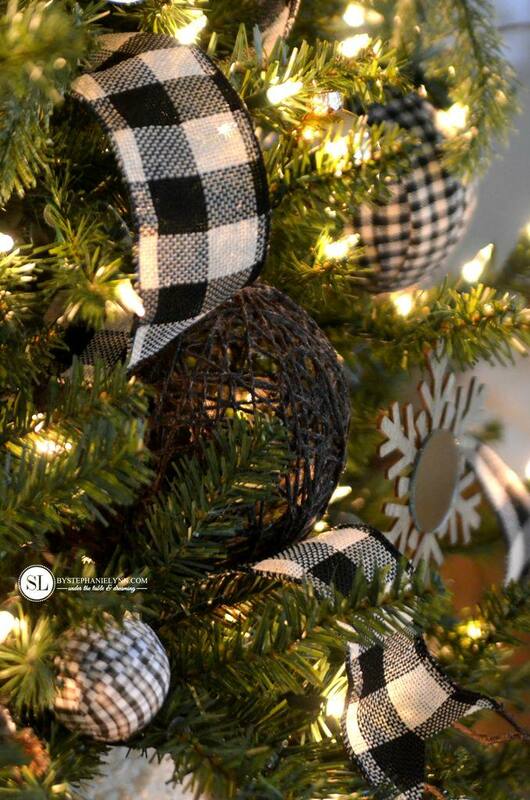 Loving this black & white plaid buffalo check Christmas tree from ‘By Stephanie Lynn’! From garland to handmade ornaments, this tree theme is so organically holiday! Click through to check out the whole theme, she has tons of great photos and some instructions! From ‘Suburble’, try this mason jar lid ornament. Easy project using some fabric (plaid, of course!) mason jar lids and some cutouts from the scrapbooking section. Homespun holiday right here! 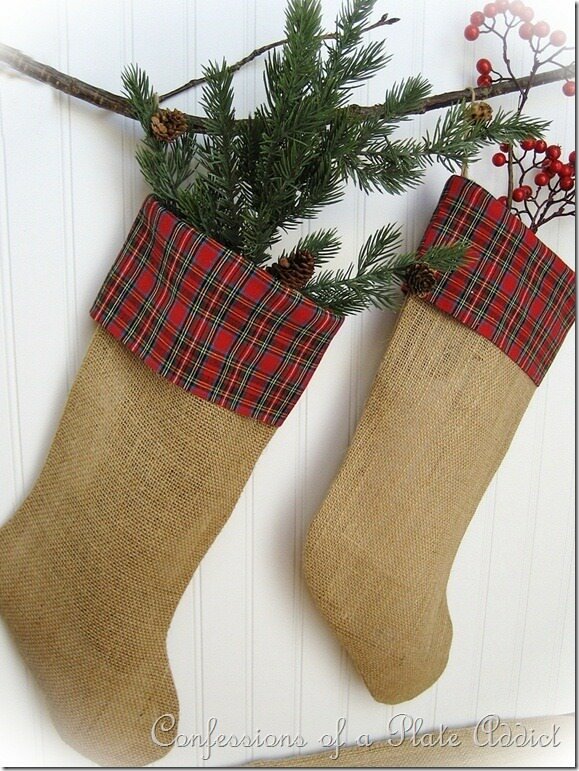 Check out these DIY burlap and plaid stockings from Debbie at ‘Confessions of a Plate Addict’. This was inspired by a stocking out of the “Ballard” catalog. 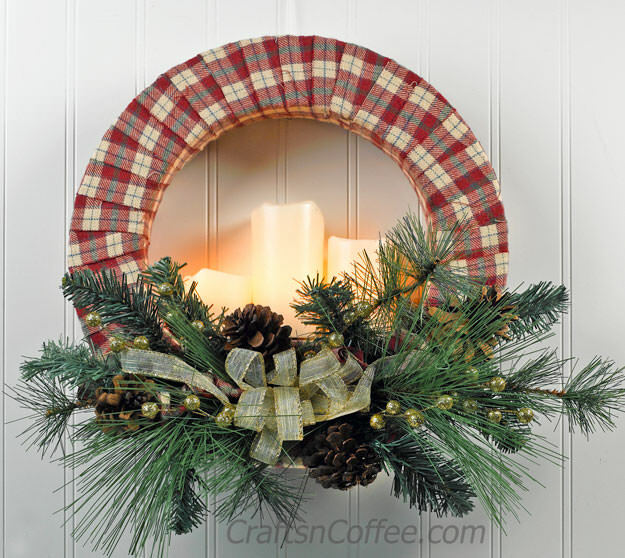 She has a burlap wrapped plaid wreath tutorial, too! 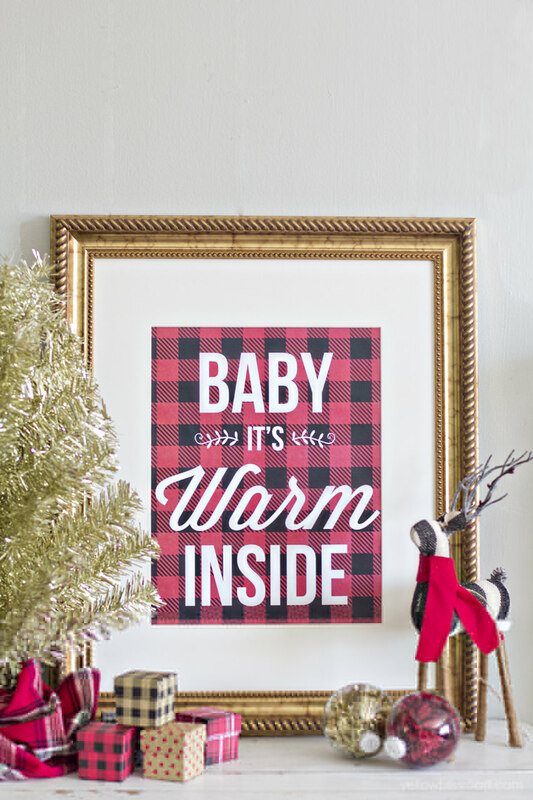 In LOVE with this buffalo check Christmas printable from Kristin at ‘Yellow Bliss Road‘. While I personally can’t get enough of the red check, she offers this free printable in a variety of colors. 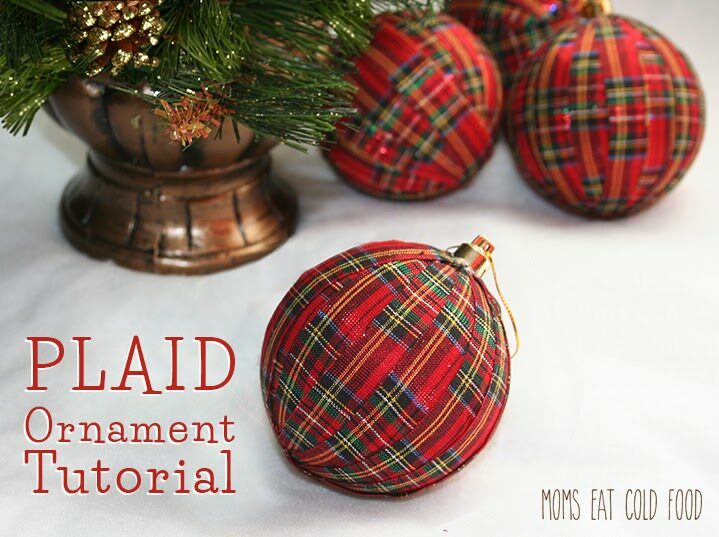 Upcycle ugly old ornaments by making these easy no sew plaid ornaments from ‘Moms Eat Cold Food’. Lots of step by step photos, but really, how much easier does it get? 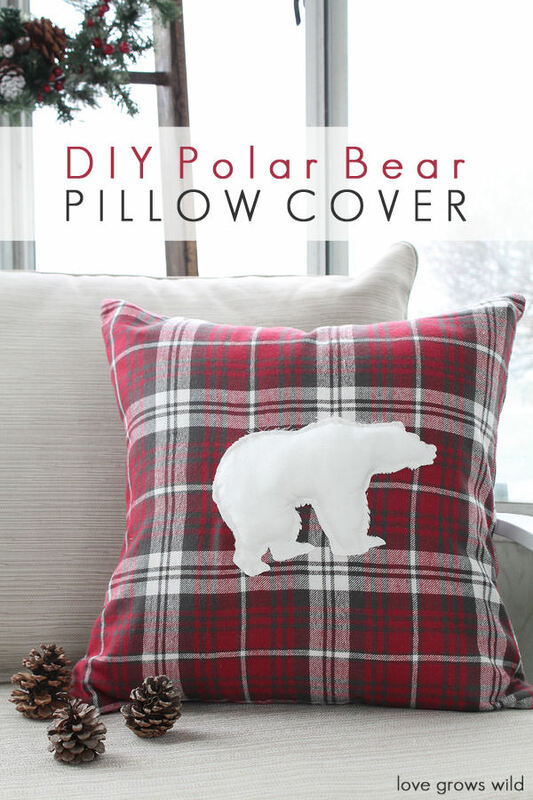 Liz at ‘Love Grows Wild’ added some rustic charm to her neutral Christmas decorating with this DIY polar bear pillow cover. Makes you want to head for the nearest ski lodge, right? 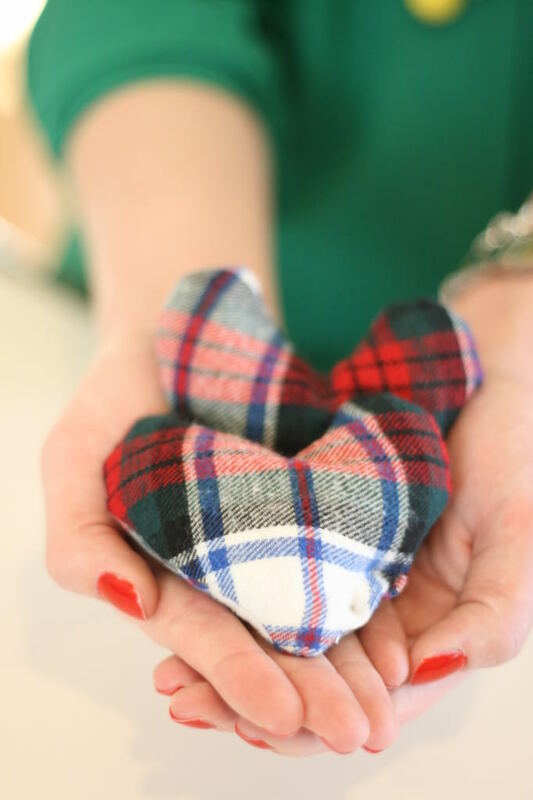 These DIY flannel hand warmers aren’t exactly “plaid Christmas projects” per say…But they sure will come in handy when you are out caroling, or going to the game, or hanging those Christmas lights! And aren’t these cozy little details the things that give us those warm and fuzzy holiday feelings? You could also use these as an add on to your gift wrap! From ‘ThriftDee’. 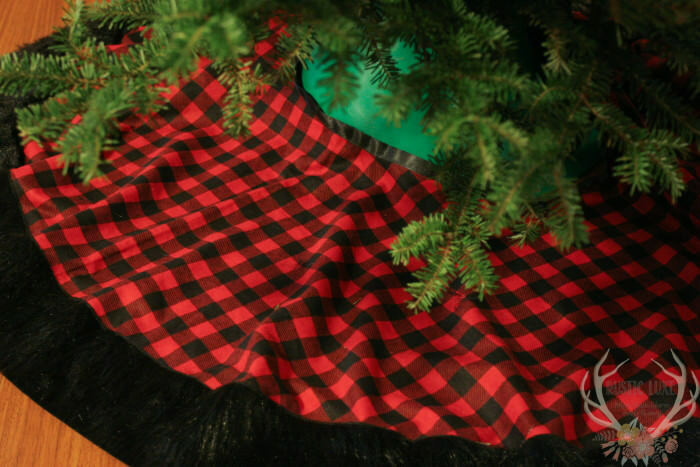 You know what I love best about this DIY buffalo plaid Christmas tree skirt? That wonderful faux fur trim… From Emily at ‘Rustic Luxe’. 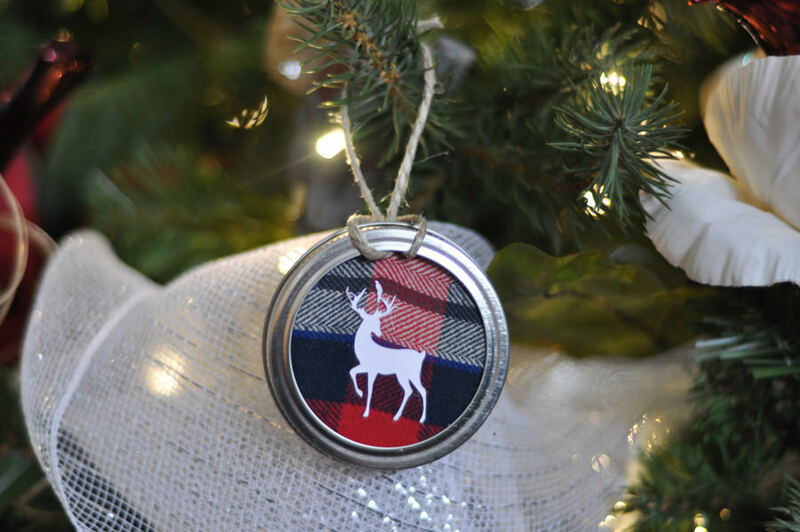 Did you enjoy our round up of great buffalo check & plaid Christmas projects? We hope so! Try our posts on DIY stocking hangers or Christmas ornament projects too! Wow, these are all both CLASSIC and CLASSY. Thank you, Kathy, for pulling them all together! Thanks so much for sharing my Buffalo Check chargers! It reminded me that I need to get those out again! 😉 Have a great week! Oh my gosh Lydi, what a great project that can be used all winter long! Thanks for sharing it with everyone!